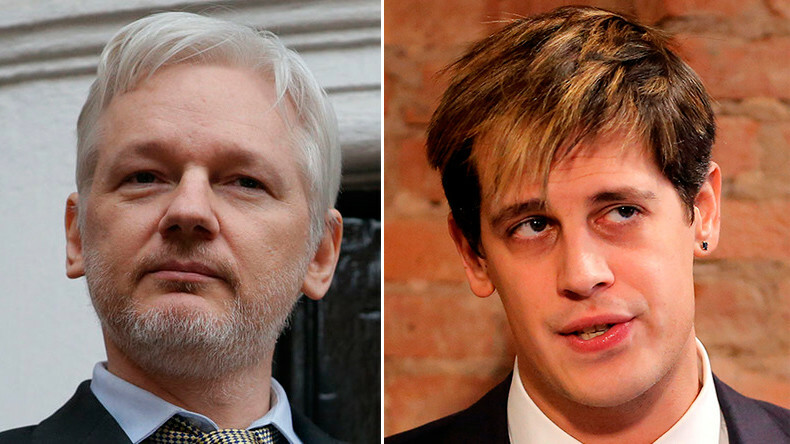 Julian Assange has attacked “liberals” for celebrating Milo Yiannopoulos’ book deal being dropped. Assange joins the American Civil Liberties Union (ACLU) in defending Yiannopoulos, who came under fire for comments he made about pedophilia.
.@nycjaneyvee Issue is 'liberals' cheering on a clearly illiberal act -- book censorship -- for political reasons with morality as cover. The tweets come after for former Breitbart editor and alt-right figure Yiannopoulos had his book ‘Dangerous’ dropped by publishers Simon & Schuster following the appearance of a video in which he appears to defend pedophilia. Yiannopoulos claimed the editing of the tapes meant his comments were taken out of context. He was also dropped from a speech he was due to make at the Conservative Political Action Conference (CPAC) and resigned from his position in Breitbart on Tuesday over the backlash to the comments. Earlier in the month UC Berkeley cancelled a planned appearance by Yiannopoulos after protests by student resulted in $100,000 worth of damage to the campus. He was permanently banned from Twitter last year after a series of tweets at actress Leslie Jones, who he described as “barely literate” and a “dude”.